Planning a Halloween party is all about the theme. Decisions on costumes, creepy decorations, the food, drinks, and candy will all guarantee a scary good time. But you, as the host, have another decision to make: Are you going to serve alcohol? If so, who are you serving it to? Would you let your underage guests have a drink too? Not only could any intoxicated underage guests be held responsible if they leave your Halloween party and cause a drunk driving accident (or any other type of accident) – you can too. According to Pennsylvania's Social Host Liability Law, the "social host" is the person who is having the party at their home and choosing to serve alcohol. While adult guests are responsible for their own actions, minors fall under the social host's responsibility. If the social host has a liquor license (like a bartender, restaurant, caterer, or bar owner) and keeps serving their intoxicated guests, they fall under Dram Shop Law. If a minor is served alcohol at your party, leaves intoxicated, and gets into an accident, you could be held responsible – even if you didn't serve the minor yourself and even if you weren't present at the time of the accident. Fines of $1,000 for the first underage drinker and $2,500 for every additional underage drinker. Jail time, depending on the seriousness of the injuries sustained in the car accident. 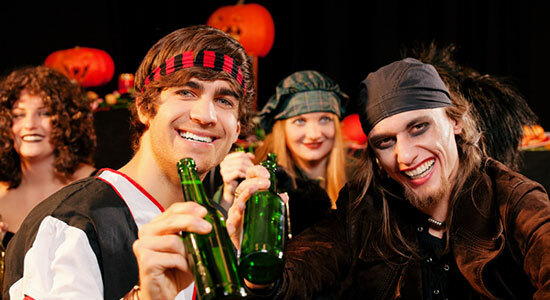 Though it may seem harmless to let your underage guests have a few drinks during your Halloween party, it's still illegal in all 50 states. No matter if the minor is 15 years old or 20 years old, the social host could be held liable for any accident they're involved with, including if they slip and fall on your Halloween decorations. Celebrate with non-alcoholic beverages or themed mocktails. Make sure there is enough food for your guests to eat while they are drinking. Encourage party guests to plan ahead and designate a driver before the party begins. Stop serving alcohol to guests at least an hour before the party ends. Limit your guest list to those who you know will act and drink responsibly. Hire a bartender, rather than having guests serve themselves. Keep cab company numbers on hand for guests who shouldn't drive. Insist guests sleep at your home if they appear intoxicated and are planning on driving. Don't let them sleep in their cars – it is possible to get a DUI without driving! Never serve alcohol to anyone under the age of 21. Were You a Victim of a Drunk Driving Accident? Too many people get behind the wheel when they are in no condition to drive, and it can have life-changing consequences. If you or someone you know sustained injuries in a drunk driving accident, or any other type of accident, contact our law firm today for a free legal consultation. We'll let you know if you have a case and how we can help.